How do I check the reliability of the vendor? To minimize risk, select a well-established vendor who has vast experience and mature processes to handle your kind of work. Also check data security measures, team qualifications, recent financials, and customer testimonials. O2I is an ISO Certified company so you can be assured of our security standards and processes. Our healthcare-related services are HIPAA compliant and RBMA certified. How will the vendor understand my specific business needs? O2I not only understands your business needs, but also organizational culture, regulatory requirements, and quality standards. We have a structured way to understand customer requirements. We take additional measures to ensure communication and process transparency. We have many years of experience and on-site experts to oversee precise knowledge transfer. I might be talking to a project manager. But how good is the team? O2I hires only the best people. All our employees hold Bachelor's or Master's degrees from reputed institutions and have 2 to 5 years of experience. For services that require a particular skill, we hire certified resources with relevant training. If the client wishes, we offer a list of actual team members and project managers along with complete profile and work experience. I want the vendor to follow my process to the dot. Is this possible? At O2I, we do not force our process on you; rather, we adopt your existing process and suggest relevant modifications to optimize efficiency. We have experienced teams that can be trained on client specific requirements so that they can follow the process and service levels precisely. Can I test the vendor before I sign an outsourcing contract? A sample before your critical outsourcing decision can help you assess capabilities, technical expertise, and quality of our services. O2I offers a no-obligation, no-risk free trial so that you can evaluate our performance, processes, technology, and people. 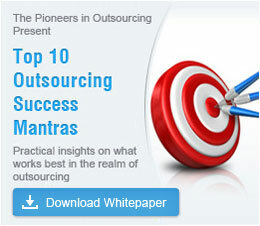 You will get the much-needed comfort level before you choose to outsource the entire project. Is your business looking at reducing overheads and the burden of managing non-core activities?